GL835 is a crystal-less USB 2.0 to Single LUN SD3.0 (UHS-I/SDR-50)/MMC Memory Card Reader controller. It supports USB 2.0 high-speed transmission to Secure DigitalTM (SD), SDHC, miniSD, microSD (T-Flash), MultiMediaCardTM (MMC), RS-MMC, MMCmicro and MMCmobile on one chip. It also supports huge density memory cards (up to 2TB), such as SDXC and Memory Stick XC. As a single chip solution for USB 2.0 flash card reader, the GL835 complies with Universal Serial Bus specification rev. 2.0, USB Storage Class specification ver.1.0, and SD/MMC card interface specification. The GL835 integrates a high speed 8051 microprocessor and a high efficiency hardware engine for the best data transfer performance between USB and flash card interfaces. Its’ pin assignment design fits to card sockets to provide easier PCB layout. Inside the chip, it integrates 3.3V to 1.8V regulators and power MOSFETs and it enables the function of on-chip clock source (OCCS) which means no external 12MHz XTAL is needed and that effectively reduces the total BOM cost. Support MMC specification v3.x / v4.0 / v4.1 / v4.2. 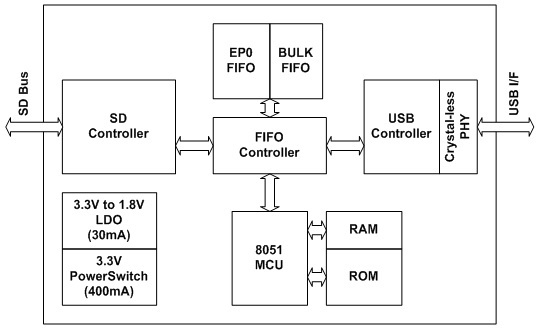 Support Power Saving mode/ Selective suspend driver for better power management.